The New Maruti DZire 2017 is launched. Yes you read that right, Maruti Dzire and not Swift Dzire. The Swift moniker has been done away with and the Dzire is now positioned as an all new model. The Dzire has been a runaway success for the company since the time it was launched. From a proper sedan, it later transformed into a compact sedan. This time, it comes in an all new avatar. 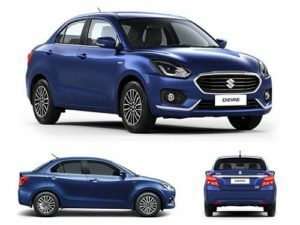 Maruti Suzuki Dzire On road price starts from 5,42,706/-. Check for price details of Dzire in CarzPrice. The same engines power the 2017 Maruti Dzire. These are the 1.2-litre K-Series petrol and the 1.3-litre DDiS diesel engines. The engine and power ratings remain the same, but the the car performs better as it is lighter. With engines are offered with a five-speed manual transmission and both engines also get AMT options. So there is a choice for automatic in both petrol and diesel and this is a big advantage over competition.